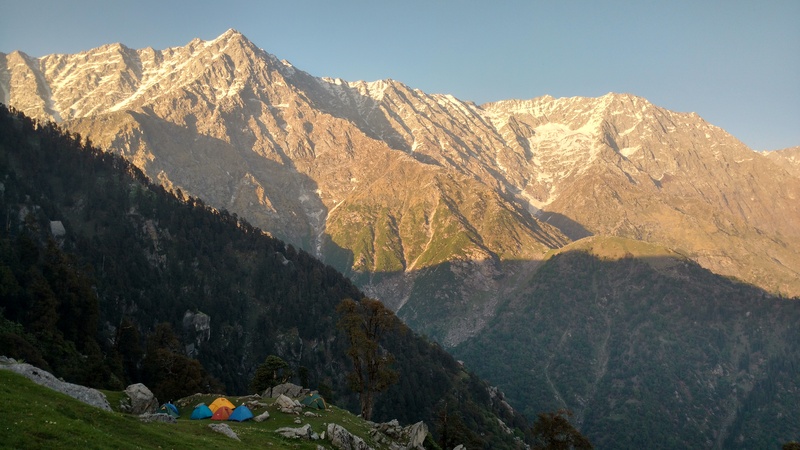 Located at an altitude of 9,760ft is the Triund Camp Site which is one of the most visited places by avid trekkers in the Himalayas. 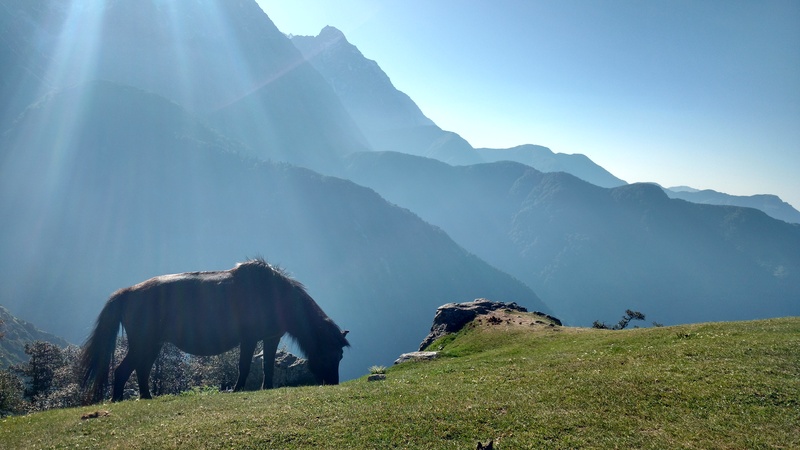 The reason why trekkers and mountain lovers enjoy this trek is because of the view it offers a top. 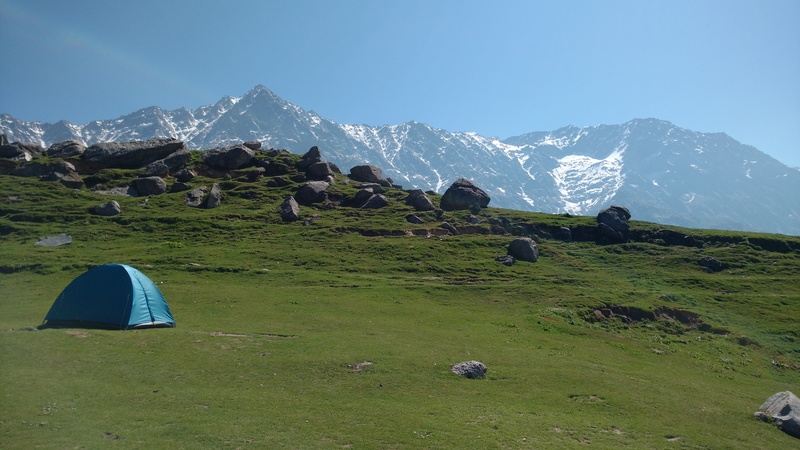 The mighty Dauladhar Range stands like a wall in front of you, unmoved and unbent. 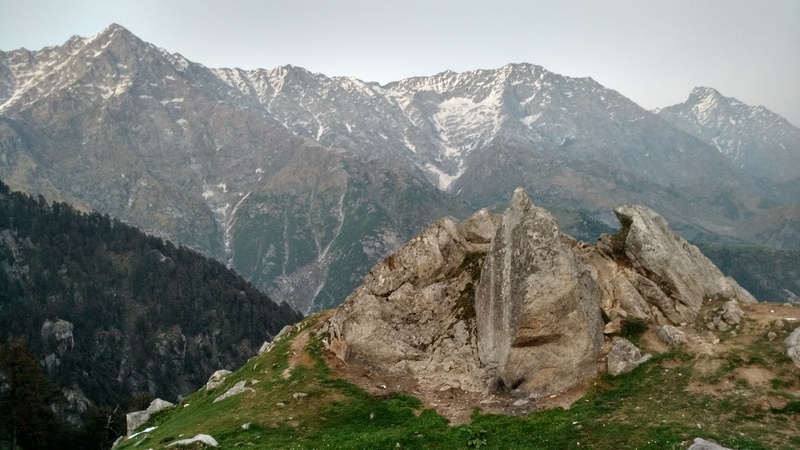 You can also see Dharamshala and McleodGanj twinkle at night from the Triund Camp Site. It usually takes 3-4 hours to complete this trek at a constant speed. But if you are not accustomed to high altitude trekking, then it may take 5-6 hours including halts, to reach the final destination. Even if you haven’t done any treks in your life, this one is achievable because of the geographical conditions and lots of resting options. At times the climb gets difficult but it’s for a shorter period. Once you get the momentum correct, you can finish the trek without much struggle. 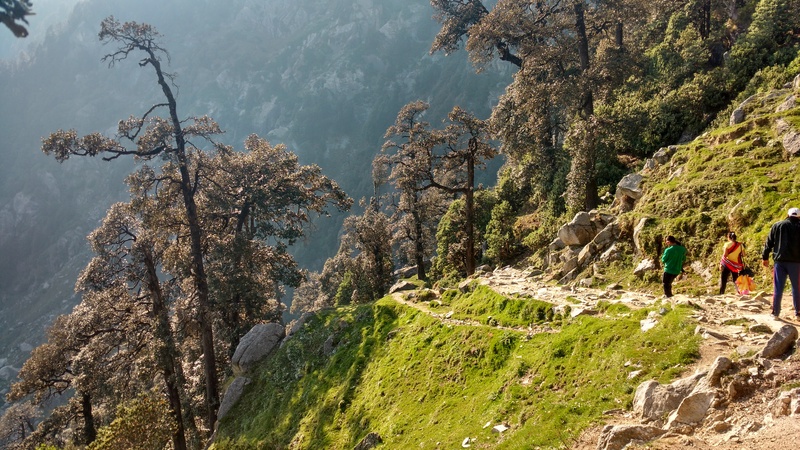 There are 3 to 4 small cafes on the way to Triund which offer bread omelette, tea, lemon juice and many other options. So don’t load your bag with eating stuff because at the camp site you can get a lot of options like Maggi, Egg Maggi, Rajma Chawal, Boiled Eggs and Tea. But remember the food prices up here are costly due to the logistical cost of carrying the food on horses. So in case a person charges you Rs. 140 for a Maggi and Rs. 60 for Tea, don’t jump off from the mountain! The climb before the campsite is a bit strenuous. But keep holding on! Because, the first thing that you see, when you complete the final hurdle is magical. The mountains stare right at you through their rocky eyes that are covered with snow. You can feel the vibrations when you calm down and stare back. The energy that flows out of them can be felt and absorbed by us to replenish our body and soul. Also, whenever you are doing a trek in the Himalayas, you must be in the right attire, by which I mean, the right shoes. Slippers, sandals, formal shoes, pump shoes, crocs are a Big NO!! You must not, by any chance, wear them and trek, if you don’t want it to be your last. Wear proper Trekking Shoes or Sports Shoes that have shock absorbs, ankle support and firm soles. 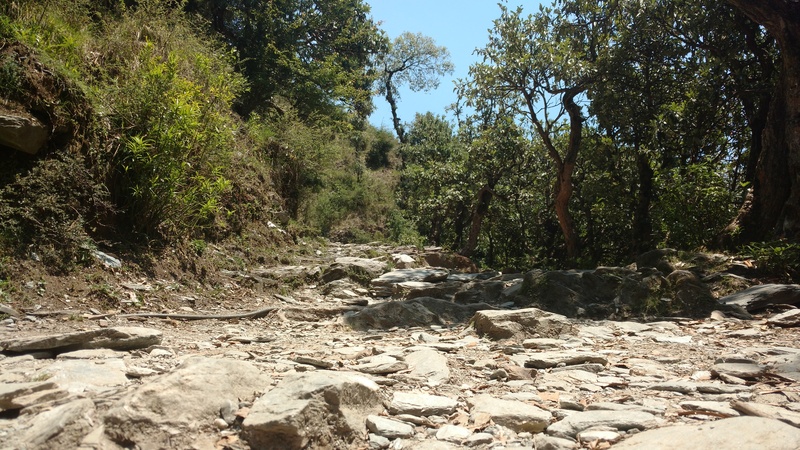 It’s alright to not have a guide for this trek. You can go on your own and set your tents by renting them from the Forest Department Guest House. 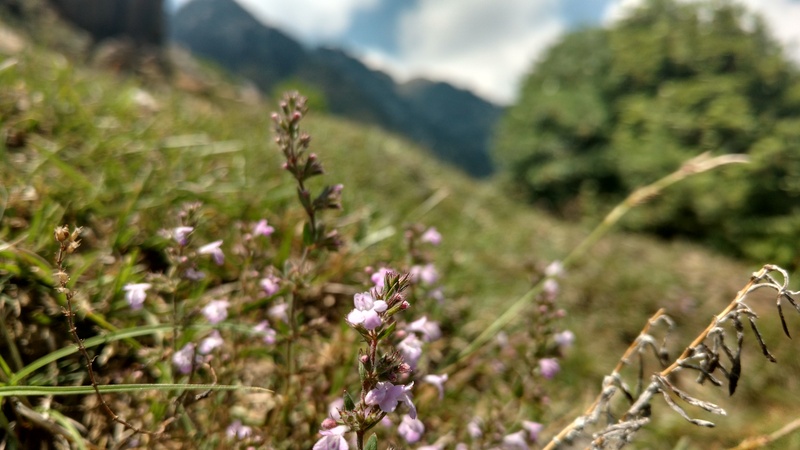 The guide that we hired was our host-cook-storyteller for the 3 days that we spent in McleodGanj & he gave us a very cheap package at the guest house – Sharma Cottage. We were overwhelmed by their hospitality and the rooms they gave us. Of course, we couldn’t see the mountains from our room but at Rs. 300 per person, it was quite a bargain! (For Booking Details and Itinerary Contact – 9769194619).